INDIANAPOLIS --In an effort to stop unnecessary panhandling, one local organization is trying to inform the public about the rules panhandlers should abide by. "I literally walk past at least 10 or 20 [people panhandling] a day, like every day," said Brooklyn Bryan, who works downtown. Bryan thinks panhandling is decreasing, but it's still an issue. The issue has caught the eye of Downtown Indy, a not-for-profit organization. "What we're trying to focus on is: 'What can we do in our lane as a civic promoter?' Bob Schultz, senior vice president of Downtown Indy, said. "Our focus is first on assessment." Step No. 1 is taking a homelessness and panhandling census -- something that hasn't been done in eight years. Step No. 2 is to educate the public on what aggressive panhandling is. "The ordinance has been on the books for many, many years, but how can we get the public more aware of what the ordinance is saying so you can give a more viable response when asked," Schultz said. Downtown Indy is passing out information cards to hotels, restaurants, businesses and more, outlining the facts. Step No. 3 is getting funding and resources to help those in need. "What we hope to do is identify longer-term fundraising to focus on bus ticks, food, mental health support and short-term housing," Schultz said. "One dollar in the cup does not do any of that -- it tells them 'Hey I can make money here, I'm going to come back tomorrow.'" Step No. 4 is reviewing possible changes to current legislation. So where should you give your money if not directly to the person? 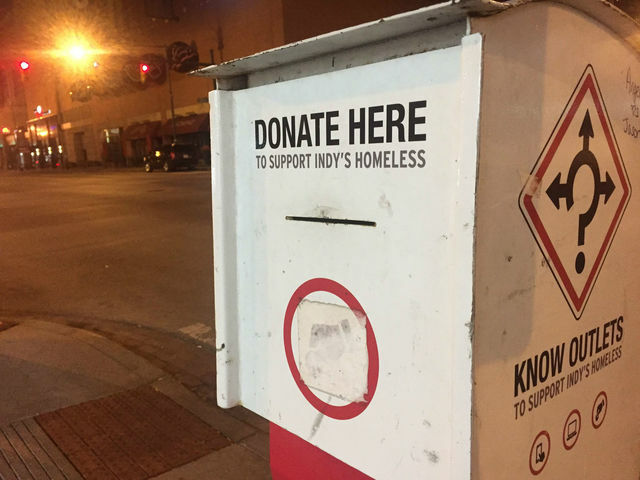 Across downtown, there are "Know Outlets," red and white boxes, which help support Indy's homeless.